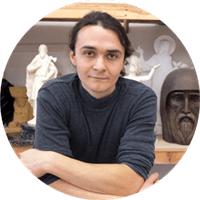 Sculptor Aleksey Leonov is an artist of many talents, sculptor-intuitionist and cosmist, who is bringing spiritual images into the material form. Sculptor Leonov is a great master of modern sculpture, mainly working in the field of monumental and easel sculpture. Leonov is famous for a strong innovation in art; at the same time he perfectly knows the laws of the academic school. By studying world philosophy, religion, science, Leonov introduces the audience to a special world of wisdom and perfection. 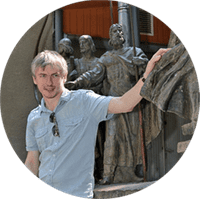 The main theme of his creative sculpture is spiritual seeking, which is exemplified by the founders of religions and philosophies, leading scientists, pioneers and inventors. As a deep and thoughtful portrait artist, Leonov seeks to convey the uniqueness and character traits of the person depicted. A special place in artist's creative work takes the theme of female beauty, which symbolises the highest inspiration, as well as children's images, — as a symbol of openness and purity. The sculptor’s r Leonov artworks are distinguished by their spirituality, higher meanings, and desire for freedom. Vasily Boroday is a philosophical artist, a thinker. The work of the sculptor is a synthesis of the search for truth. The sculptor strives for clarity, harmonic simplicity, restraint in compositional decisions. The distinctive feature of his work lies in laconic expression, reminiscent of the canonical language of the icon. Boroday works in the field of easel and park sculpture. His favorite theme of creativity is the inspiring heroes. The sculptor conducts trainings in his creative workspace in the following areas: academic modeling, composition and graphics. A professional approach, encyclopedic knowledge and an unsurpassed sense of humor, — keeps attracting even more students to the sculptor Boroday. Sculptor Shevchenko is a sculptor-expressionist. An energetic and active sculptor literally fills his work with movement, the expressive power of life. A distinctive feature of sculptor’s work is an increased expressiveness as a manifestation of feelings, moods, thoughts. Auguste Rodin’s words inspired Vladimir Shevchenko for a creative credo: «The most important thing for an artist is to be energized, to love, to hope, to tremble, to live. First and foremost — to be a human.» Shevchenko works in the field of monumental and easel sculpture. 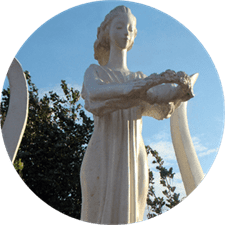 The sculptor approaches all stages of sculpture production very thoroughly: from sketching, layout, modeling to molding and bringing the sculpture to its perfection. If you have any questions or suggestions for cooperation. You can write to us.